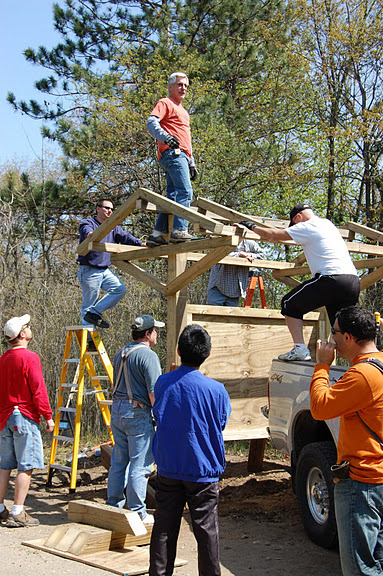 Our volunteers contribute in a variety of ways, from simply trimming branches, to organizing fund raising events with hundreds of participants, to designing some of the best trails in America. We track volunteer work hours and reward our outstanding volunteers at the end of each year. Fall is in the air, and in Michigan that means hunting season! Most of our trails are in areas that are closed to hunting, but three of our area trails will see lots of activity: Island Lake, Proud Lake, and Highland - all state recreation areas. Most hunters on public land know there is all sorts of activity in the woods during hunting season and will expect to see bikers on the trail. Many hunters welcome bikers, as more people in the woods keeps deer moving and active. While the hunting accidents are exceedingly rare - you're vastly more likely to be injured in the car ride to the trailhead - some riders choose to avoid these three trails during firearm season. That's up to you. If you do ride, it's not a bad idea to wear something in blaze orange to make you easily identifiable to others in the woods. There's a pre-meeting ride at 3! Meet at Drafting Table and take the paved path to and from ILRA. This will be a long one, approximately 35 miles. 3:00 should give us enough time to complete the route and clean up in time for the September chapter meeting at Drafting Table. This is the 12th annual MCMBA Benefit race held at Maybury State Park. 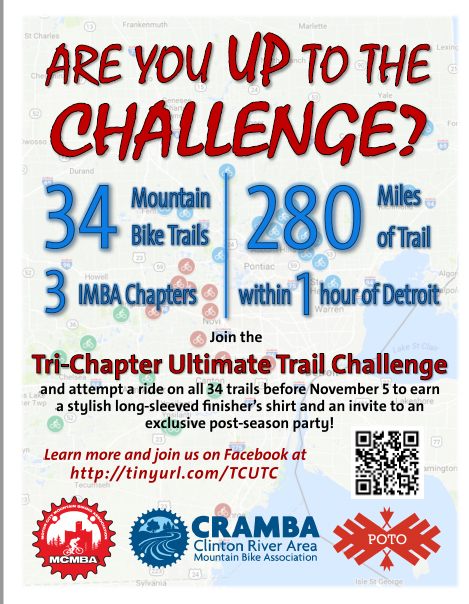 Each year this event draws hundreds of racers and raises thousands of dollars for the Motor City Mountain Bike Association. Funds that go directly back into trail building, maintenance, fun events and education programs. This is always a fun race and a great way to support the MCMBA either as a participant or as a volunteer. Pre-registration is open and you can order a limited edition Maybury TT Tee shirt at the following link. The race is Sunday August 27th, 2017, please feel free to contact me for any further questions. A resolution to declare July 2017 as Tree Farm Relay Month. Resolved by the Motor City Mountain Biking Association, an IMBA chapter, that the members of this body declare July 2017 as Tree FarmRelay Month in the state of Michigan. We recognize the contributions that the MCMBA, Team Tree Farm, and our volunteers have made to the communities and economy of this area. Join us! Visit mcmba.org/relay to get started! Spring Bike Demo, May 6th at Island Lake!